Left to right: Jennie Greenberry, Danforth Comins. Photo courtesy Jenny Graham and Oregon Shakespeare Festival. William Shakespeare’s Hamlet is a masterpiece filled with ambiguity. Why does the titular character take so long to exact his plan of revenge? How real is the ghost of the old king? What is the source of Ophelia’s madness, and what goes through Hamlet’s mind as the events of the play unfold? Though many productions are comfortable with merely asking these questions, this season’s raw, powerful production of Hamlet dares to provide answers. In an unusual portrayal, Danforth Comins’ Hamlet is practical and focused. He sees his plan to kill Claudius as renewed purpose for his life, and thus most of Hamlet’s actions and dialogue in the first act become small parts of his grander scheme. In this production, it could be said that Hamlet’s fatal flaw, instead of obsession with his uncle, is overconfidence in his plotting; he shows genuine remorse when his scheme starts claiming innocent lives in the second half of the play. This is a fresh and interesting decision on the part of Comins and director Lisa Peterson; many productions portray Hamlet as becoming icy and uncaring the moment he decides to assassinate Claudius. Other standout characters include Horatio (Christiana Clark) and Polonius (Derrick Lee Weeden). Clark is sincere and emotional without betraying Horatio’s stoic background, and provides a breath of air amidst the unfolding tragedy. In the nest of vipers that is the Danish court, Clark’s Horatio says what she means without ulterior motive. Weeden’s portrayal of Polonius is sympathetic, if a bit naïve; he struggles to maintain the delicacies of his life, but he doesn’t condescend and is a truly caring father. Even Hamlet recognizes this, despite tormenting him throughout the first half; the look of surprise on his face as the dead Polonius falls out of the curtain is a defining moment of his character, and we as the audience understand why. The sets and costumes (Laura Jellinek and David C. Woolard, respectively) are some of the most profound and meaningful technical theatre I have seen. The promotional materials for the play describe doom metal as a major theme; Hamlet holds a guitar menacingly on the front of the playbill. 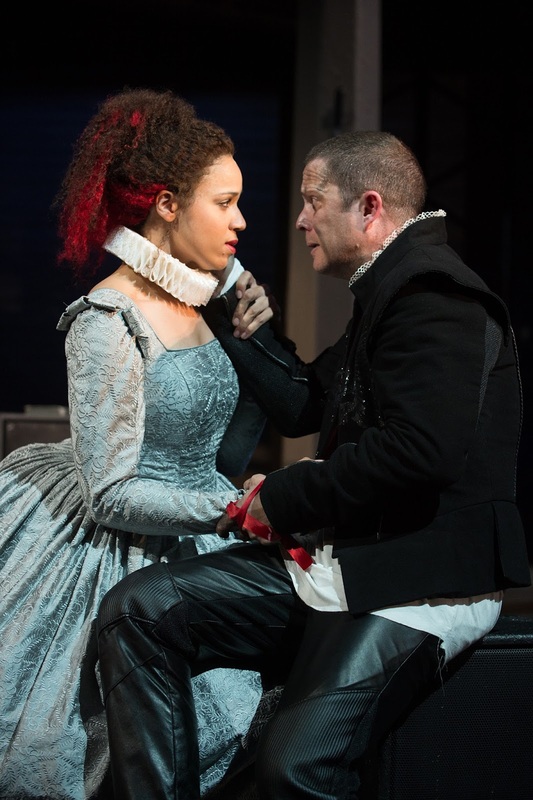 Yet although the heavy metal is always prevalent on stage (the available furniture is only a few clusters of speakers), the guitars start up solely when peering into the mind of Hamlet, with the exception of Ophelia in the depths of her madness. Allowing only Hamlet the use of the play’s flashiest theme focuses the play internally, making it less about Danish political intrigue and more about the prince’s personal disintegration. The use of color in the production deserves special attention. At the beginning of the play, all the characters dress in blacks, whites, and grays, bringing to mind the formality of the aristocracy. As the court sinks into chaos, insanity, and death, red – in the form of blood, light, and props – slowly engulfs the entire stage. Of note are the red highlights present in Ophelia’s hair from the very beginning of the play, subtly hinting at both the collapse of the royal family and her personal decline. The traveling players, however, blast the stage with bright colors to signify their detachment from the rest of the cast. Oregon Shakespeare Festival’s 2016 production of Hamlet lives up to expectations set by their stellar 2010 version, yet takes significantly more risks. The outlandish doom metal theme could have been overused; the interpretations of the characters could have been misconstrued. But instead, the 2016 production of Hamlet becomes one of the greatest, most outstanding productions that OSF has staged in recent memory.